Highway 100 was a SLEEK NEW ROAD KNOWN AS 'LILAC WAY.' On sunny spring afternoons, families from Minneapolis piled into their Ford with a picnic lunch. The kids chattered excitedly as the car passed RURAL AREAS WITH OPEN LAND AND BLUE SKY. Passing rows of FRAGRANT LILACS, they pulled off the highway into a rustic park with picnic tables and rock gardens. After roasting hot dogs in the round stone 'BEEHIVE' FIREPLACE with other families, they headed home – a part of their community, and now, a part of history. •Successfully moved the limestone beehive fireplace and picnic table from the original Lilac Park on Minnetonka Boulevard to this park on October 22, 2006. •Restored seven historically significant structures, including five tables, the beehive and council ring. •Created new patterened cement bases for the restored structures. •Built three new features using limestone block harvested from the dismantled structures of the original parks. •Installed a new trail connection to Southwest Regional Trail. •Restored the landscaping based on the original plan. •Resurfaced the circular internal biking/walking trail (formerly a roadway). 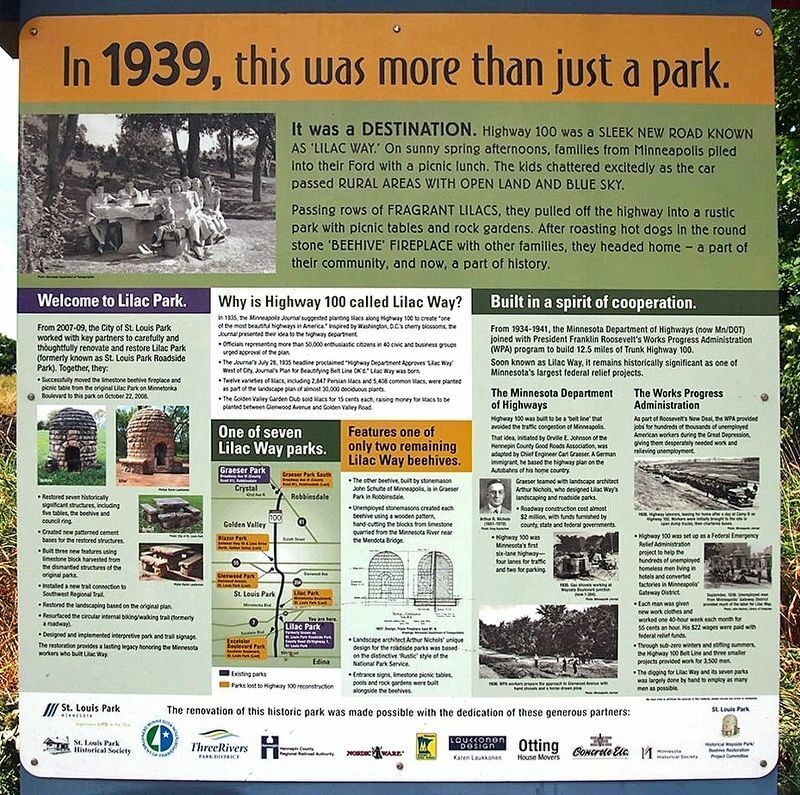 •Designed and implemented interpretive park and trail signage. The restoration provides a lasting legacy honoring the Minnesota workers who built Lilac Way. Why is Highway 100 called Lilac Way? In 1935, the Minneapolis Journal suggested planting lilacs along Highway 100 to create "one of the most beautiful highways in America." Inspired by Washington, D.C.'s cherry blossoms, the Journal presented their idea to the highway department. •Officials representing more than 50,000 enthusiastic citizens in 40 civic and business groups urged approval of the plan. •The Journal's July 28, 1935 headline proclaimed "Highway Department Approves 'Lilac Way' West of City. Journal's Plan for Beautifying Belt Line OK'd." Lilac Way was born. •Twelve varieties of lilacs, including 2,547 Persian lilacs and 5,406 common lilacs, were planted as part of the landscape plan of almost 30,000 deciduous plants. •The Golden Valley Garden Club sold lilacs for 15 cents each, raising money for lilacs to be planted between Glenwood Avenue and Golden Valley Road. Features one of only two remaining Lilac Way beehives. •The other beehive, built by stonemason John Schutz of Minneapolis, is in Graeser Park in Robbinsdale. •Unemployed stonemasons created each beehive using a wooden pattern, hand-cutting the blocks from limestone quarried from the Minnesota River near the Mendota Bridge. •Landscape architect Arthur Nichols' unique designs for the roadside parks was based on the distinctive 'Rustic" style of the National Park Service. •Entrance signs, limestone picnic tables, pools and rock gardens were built alongside the beehives. Built in a spirit of cooperation. From 1934-1941, the Minnesota Department of Highways (now Mn/DOT) joined with President Franklin Roosevelt's Works Progress Administration (WPA) program to build 12,5 miles of Trunk Highway 100. Soon known as Lilac Way, it remains historically significant as one of Minnesota's largest federal relief projects. Highway 100 was built to be a 'belt line' that avoided the traffic congestion of Minneapolis. That idea, initiated by Orville E. Johnson of the Hennepin County Good Roads Association, was adapted by Chief Engineer Carl Graeser. A German immigrant, he based the highway plan on the Autobahns of his home country. Graeser teamed with landscape architect Arthur Nichols, who designed Lilac Way's landscaping and roadside parks. •Roadway construction cost almost $2 million, with funds furnished by county, state and federal governments. •Highway 100 was Minnesota's first six-lane highway—four lanes for traffic and two for parking. As part of Roosevelt's New Deal, the WPA provided jobs for hundreds of thousands of unemployed American workers during the Great Depression, giving them desperately needed work and relieving unemployment. •Highway 100 was set up as a Federal Emergency Relief Administration project to help the hundreds of unemployed homeless men living in hotels and converted factories in Minneapolis' Gateway District. •Each man was given new work clothes and worked one 40-hour week each month for 55 cents an hour. His $22 wages were paid with federal relief funds. •Through sub-zero winters and stifling summers, the Highway 100 Belt Line and three smaller projects provided work for 1,500 men. •The digging for Lilac Way and its seven parks was largely done by hand to employ as many men as possible. Erected by St. Louis Park. Location. 44° 56.549′ N, 93° 20.787′ W. Marker is in St. Louis Park, Minnesota, in Hennepin County. Marker can be reached from Minnesota 7 Service Rd. Touch for map. Markers is a short distance from the parking lot, on the north side of the footpath. Marker is in this post office area: Minneapolis MN 55416, United States of America. Touch for directions. Other nearby markers. At least 8 other markers are within 3 miles of this marker, measured as the crow flies. First School House (approx. 2.1 miles away); Como–Harriet Streetcar Line (approx. 2.1 miles away); Geology of Minnesota (approx. 2.1 miles away); Harriet Bandshells / Our Park Legacy (approx. 2.1 miles away); Peavey Fountain (approx. 2.2 miles away); Minnehaha Grange Hall (approx. 2.2 miles away); Old Cahill School (approx. 2.2 miles away); History of the Garden (approx. 2½ miles away). More. Search the internet for In 1939, this was more than just a park.. Credits. This page was last revised on June 2, 2018. This page originally submitted on May 30, 2018, by McGhiever of St Paul, Minnesota. This page has been viewed 49 times since then and 5 times this year. Photo 1. submitted on May 30, 2018, by McGhiever of St Paul, Minnesota. • Bill Pfingsten was the editor who published this page.